The verdict comes as part of a provincial crackdown on cults, as the ruling Communist Party continues its national campaign to restrict unregistered churches before new religious regulations come into force next week. The six Christians received long sentences of up to 13 years by a court in Lincang city, west Yunnan, which found them guilty of being part of a sect called the Three Grades of Servants and of “using an evil cult to organise to undermine law enforcement”, their lawyer, Xiao Yunyang, told Radio Free Asia. According to Release International, since 2016 China has used its campaign against the sect “as a pretext to round up about 200 Christians across Yunnan: some Christians have already been convicted, while others are awaiting trial”. A local source told World Watch Monitor that the authorities “seldom give such long prison sentences for just religious reasons, even in a sensitive region like Xinjiang [in the Uyghur Autonomous Region]. But both the Three Grades of Servants and Falun Gong are well-known cults in China and leaders of [these movements] are subject to heavy punishment”. According to RFA, Xiao has been notified that his license to practise law will be reviewed to see if he was “illegally” defending his clients. Meanwhile two pastors in neighbouring Guizhou province, Su Tianfu and Yang Hua of Huoshi Church, were fined the equivalent of more than 1 million US$ earlier this month, after the money they received in collections and offerings from their congregation was deemed “illegal income”. Huoshi Church and its leaders have clashed with the authorities before. In 2015 the church was raided by police during the opening ceremony of its new venue, which was attended by hundreds of guests, including some foreigners. The high-profile church was forced to close and its pastor, Yang Hua, was detained. The church did reopen but was then put under pressure to register as a state-sanctioned entity. Yang Hua was last year sentenced to two and a half years in prison, while Su Tianfu remains under house arrest. A church deacon, Zhang Xiuhong, was also detained for more than two years before his release in August 2017. A local source told World Watch Monitor the government specifically targets high-profile churches, but that many other congregations do not experience the same level of harassment. Last week a high-profile church in northern China was demolished, the second in less than a month. World Watch Monitor’s source said the order seemed to have come from the top, illustrated by the fact the state-run newspaper reported on it. 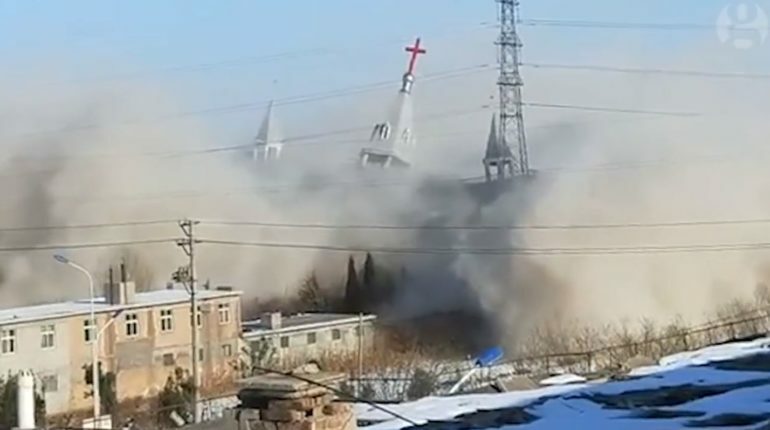 The Golden Lampstand Church in Linfen, Shanxi province, was demolished earlier this month (Photo: still taken from Guardian video). In his speech at the Communist Party Congress in October, President Xi Jinping reiterated the importance of Chinese nationalism, saying the government would “uphold the principle that religions in China must be Chinese in orientation, and provide active guidance to religions so that they can adapt themselves to socialist society”. The new regulations on religious affairs are due to come into force on 1 February. They include guidelines on religious education, the types of religious organisations that can exist, where they can exist and the activities they can organise.